To manage and configure the bulk selling feature, go to the admin panel, Settings > Selling and Bulk CSV to manage all settings related to bulk uploads." Bulk Items uploader allow sellers to produce a valid comma separated value file (from any text-editor or spreadsheet software such as excel) to list all line items to be bulk uploaded to the marketplace. You control the maximum number of items a seller can upload through his/her .csv file and other settings allowing thousands of products to be uploaded in a matter of seconds, saving time. The visible bulk items API overview page provides necessary information for sellers looking to utilize this feature on the marketplace and provides direction on how to properly set the .csv file. 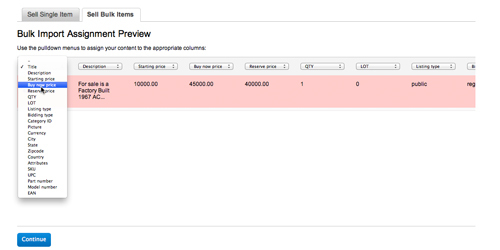 Additionally, the Bulk Items Preview offers an "Assignment" feature allowing your sellers to assign the appropriate columns to the headers for maximum flexibility and ease of use for columns that may or may not be included. It is recommended that sellers download the sample csv file provided to ensure the format remains the same and less room for error when sellers are uploading products. 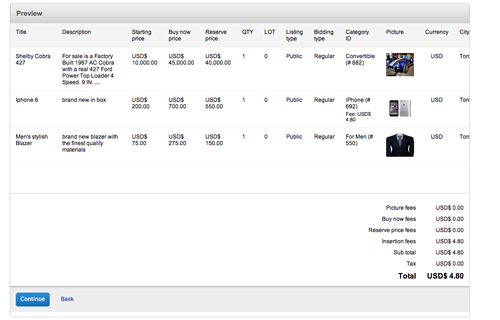 Final preview will display the items including images and applicable listing fees.